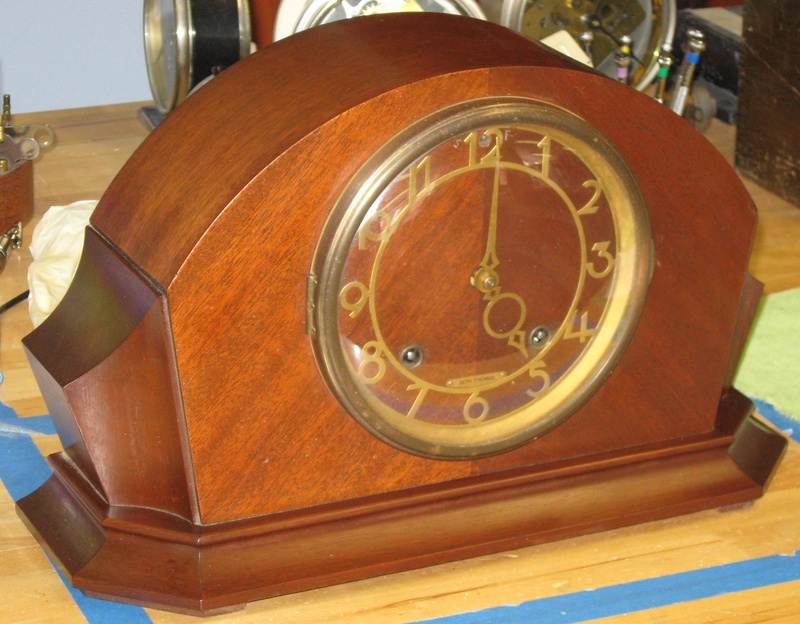 Here is a “modern” style Seth Thomas mantel clock made in 1946. It has the newer time and strike clock movement (see my post “1940s Seth Thomas 8 Day Time and Strike Clock Movement” for more details about this movement). The mahogany case is 14 1/16 inches wide and 8 9/16 inches tall. The minute hand is 2 1/2 inches long. Note on mainsprings: When replacing broken mainsprings in this Seth Thomas movement, use a thinner spring than original, to give the movement a longer life. A spring around 0.0160 – 0.0165 inch thick is good.